Browsing articles tagged with " buy a steel barn home"
In the farming and ranching business, the ability to protect your livestock and harvested crops can be the difference between keeping your farm running and having to close it forever. Keeping hay stacks and livestock out in the open may seem like a great idea, but having steel barn homes for them will make sure that they are protected under every weather circumstance imaginable. An unexpected rain or snow storm can make your hay unsellable, and hard weather conditions can make it hard to make sure that your herd keeps its weight during a rough winter. Steel barn homes for your cows and crops are the answer to this difficult problem. But where can you find the best steel barn homes for your hard earned money? The answer is at Coast to Coast. The problem with most companies that make barns or other storage buildings is that they do not use a good enough quality of material. Wood and other materials just will not last long enough and are extremely difficult to maintain over long periods of time. A steel building, on the other hand, will maintain its look and its functionality for years to come. 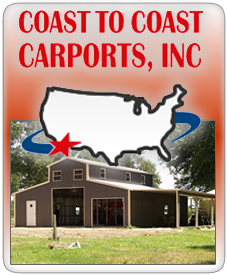 In fact, every building sold at Coast to Coast has a 20 year warranty on rust through of framing on roofing material assuming normal user care and maintenance. No other company offers such a great warranty. You have a choice when it comes to providing storage space for your important crops and living space for your livestock. If you want to make sure that the important things on your farm are cared for and stored well, then you simply need a barn from Coast to Coast. Make sure to take a look at our gallery to see the various types of barns we can build, and don’t forget to contact us today for a free quote for your next barn.